It is with great sadness that I have to inform you of the passing of Erwin Stein December 19, 2018. Professor Stein was an international academic authority and a renowned expert in computational mechanics. He received the Gauss-Newton Medal, the highest award given by our society, among many other prizes and recognitions in Germany, Europe and all over the World. His scientific legacy and his example will guide us and also future generations. 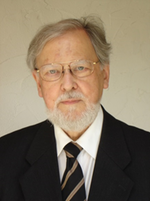 Moreover, I believe that it is also important to acknowledge his longstanding support and continuous work for the International Association of Computational Mechanics. His death leaves a deep void in the heart of many of us.